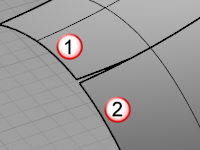 Selecting a curve or surface edge automatically selects all curve segments connected with the level of continuity set by the ChainContinuity option. Controls the level of continuity required between segments to be selected with the AutoChain option. Selects curves in the positive curve direction. Selects curves in the negative curve direction. Selects curves in both the positive and negative curve direction. If the gap between two edges/curves is less than this value, the chain selection will ignore the gap and will select the next segment. When Continuity is set to Tangency, if the angle between two edges/curves is less than this value, the chain selection will consider the criteria for continuity met and will select the next segment.